Migraine headaches are tough to deal with anytime, I have always suffered with them, and normally I would just go to sleep or lay in a dark room in quiet and wait for it to fade. 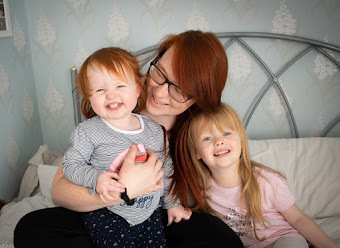 Now I am a parent that just isn't possible, so I thought I would put together a post full of tips on how I cope with migraines now I'm a parent to two noisy, stubborn, under 4-year-olds. As you can imagine, it's not an easy task dealing with them when your head is pounding. So here are my top tips. Figure out what triggers your migraines and avoid them. It took me a long time to establish what was triggering my migraines, and sometimes there is no trigger but for the majority of the time, my migraines are brought on by lack of sleep or the change in weather. Some common migraine triggers include lack of sleep, dehydration, skipping meals, stress, or changes in weather. Emily knows what a migraine is, she knows that it hurts my head and that when it happens I need quiet calm time. Making her aware of them, and what is going on can help massively - as it gives you the ability to establish a routine or plan for the days when your migraine is too much to cope with. I can't imagine having a migraine and then trying to explain to Emily what it is and why she has to be quiet. The key is to explain it really simply - I made Emily understand what a migraine was by comparing it to her brain freeze (from ice cream) because it is something she has experienced and didn't like, its something she hasn't forgotten and can sympathise with. Being prepared may seem like a really obvious one, but many people don't have a plan in place. I know that skipping meals triggers a migraine, so I make sure that I plan my meals and eat at the same time as Emily, that way I don't forget to eat, and I don't end up with a migraine. I also always keep migraine medication such as sumatriptan, or imigran in my bag. I never go out without my bag meaning I always have a strip of medication handy whenever I may need it. I find that if I take my medication just as I notice the first symptoms of a migraine it reduces its severity. I always make sure I have plenty of playdoh and kinetic sand on hand. If I have a migraine come on, I find it really hard to keep up with Emily and join in with all the games or various different things that she wants to do. Having those two quiet calm activities to fall back on really helps, as she loves the hands-on messiness of the activity, and it is also really simple and easy for me to clean up. It is really important to make sure that you have spoken to your local GP or a doctor if you suffer from regular migraines, they will be able to establish if there is something more causing them, and also sort out a medication plan for the times when they are just unbearable. Migraines are not fun, for you or your child - so making sure you find a treatment that works is so important. I'd love to hear if you have any tips or tricks when it comes to parenting while your suffering from a migraine.